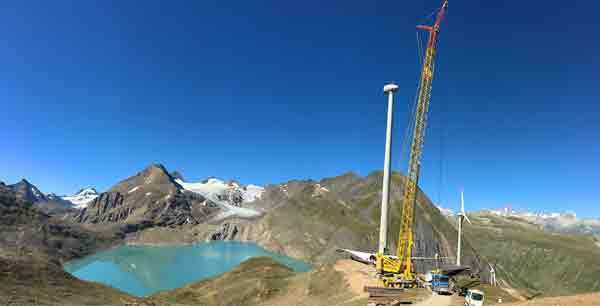 On behalf of German company Enercon GmbH, Switzerland-based Welti-Furrer Pneukran & Spezialtransporte AG erected three E-92 wind turbines at the Gries Pass, which has an altitude of roughly 2,500 meters. Since this type of high alpine project is enormously challenging on equipment, the crane service provider decided to rely on the proven strengths of its Terex TC 2800-1 lattice boom truck crane. In addition to high reliability, there were other aspects that were decisive in the company’s choice of crane: “On one hand, the TC 2800-1 is extremely maneuverable. On the other, it features extraordinary gradeability. These are two indispensable prerequisites for working in high mountain areas, and they’re exactly the reason why this crane is our preferred machine when it comes to this type of high-altitude project,” explains Welti-Furrer project manager Werner Häfliger. This is further complemented by the crane’s flexible outrigger system, which can have an area of either 10 x 10 meters or 14 x 14 meters and makes it possible to adapt to difficult work site conditions – precisely the type of conditions that the Welti-Furrer team and its machine would be facing from the very start. Even the drive up to the work site on the evening of July 25 at 9 pm was anything but easy for the TC 2800-1, its assist crane, and 15 transportation trucks accompanying it: Uphill slopes of up to 18.5 percent, numerous narrow passageways, and the vehicles’ altitude-related power loss made things hard not only for the equipment, but also for the people involved in the project. In fact, entire paths and setup areas had to be literally hewn out of solid rock and, in certain cases, cleared by means of explosives in advance. However, this time-consuming prep work was exactly what enabled the team to get the TC 2800-1 crane to the work site on schedule, at 2:30 am. The team had estimated a total of two days for setting up the crane with four assembly technicians, and was able to get things done according to plan once again. This was due in large part to the TC 2800-1 truck crane’s ease of assembly. For the upcoming lifts, the crane was set up with an outrigger area of 14 x 14 meters and a counterweight of 200 tonnes on the superstructure. For the boom, the Welti-Furrer specialists chose an SH/LH SGL_S7 configuration with a 90-meter main boom. In addition, they mounted a lightweight, rigid LF-2 jib, which contributed an additional 12 meters to the total height. This resulted in an available boom length of 102 meters – enough to erect the wind turbines’ 84-meter-tall tubular steel towers and easily lift all components – with a maximum weight of 64 tonnes – while working at radii between 22 and 25 meters. The lifts themselves were a matter of routine: “Our team has plenty of experience with projects in high mountain areas and is perfectly able to handle the conditions that are particular to that kind of terrain,” Werner Häfliger points out. Certainly an important thing, as extreme weather conditions are the norm for this type of altitude – not only in terms of weather that can change very rapidly, but also in terms of high-speed winds that can start at any moment. And when the weather really “goes all out,” you can even get snow in the middle of summer, as was the case on July 15, 2016: “That day, the pass was blocked by snow, which meant we couldn’t access the site,” Werner Häfliger reports. As a result, the schedule for erecting the three wind turbines became extremely tight, and the scheduled three months that the Terex TC 2800-1 would be spending at the site had to be enough to erect all three wind turbines together with the Enercon assembly team. “We made sure to take full advantage of every single second of wind-free time we got, which enabled us to finish things on schedule despite the adverse conditions and hand over all the turbines on time. And we owe a big part of that to having combined a perfectly coordinated team with the right machine for the job. In fact, this is not the first time the crane has proven its worth in high alpine projects,” Werner Häfliger happily summarizes.